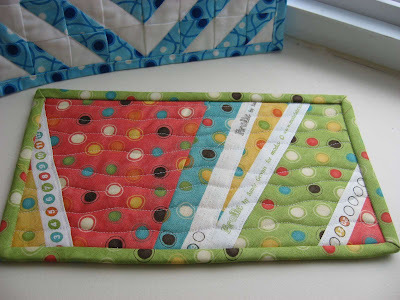 Hooked on Needles: More Mug Rugs ~ These Little Things Are F-U-N! More Mug Rugs ~ These Little Things Are F-U-N! These are my two mug rugs for the swap, although I like them both so much that I am actually tempted to keep them for myself! Do you recognize the fabrics I used? This one is made with fabric scraps and selvages left over from the Eat Play Sleep Repeat quilt I made for a friend's new baby late last year. The fabric is Frolic by Sandy Gervais for Moda and even the selvages of this fabric are fun to look at! I made this one using traditional quilting techniques of piecing, layering, quilting then binding and I really love how it turned out. 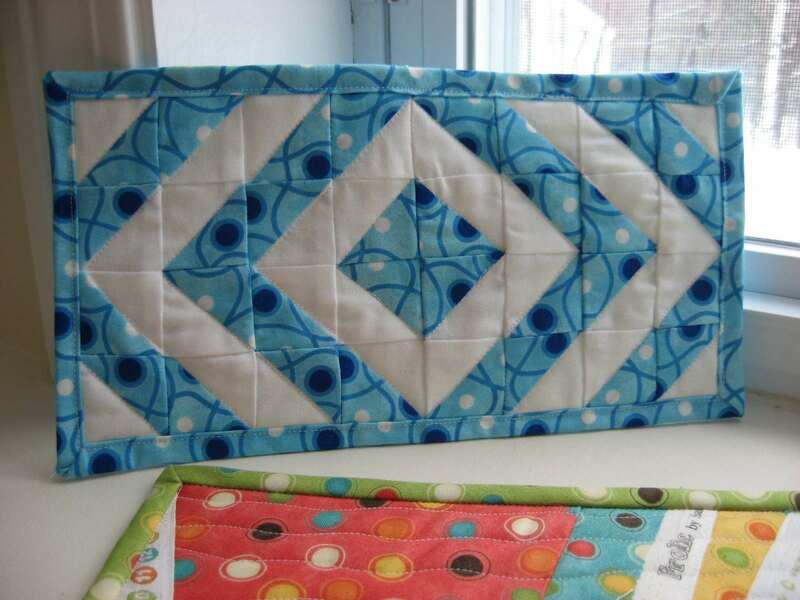 How about this bright and fun blue and white mug rug? Do you recognize this fabric? These tiny little one inch blocks are the leftovers of the siggy blocks I made about a year ago for the Modern Siggy Swap. For each block, a white and blue triangle was cut off the back of two corners, so I ended up with a couple hundred of them. At first I thought I would just throw them away because they were so small, but then I saw what other people were doing with theirs and I decided to save them for some future use. 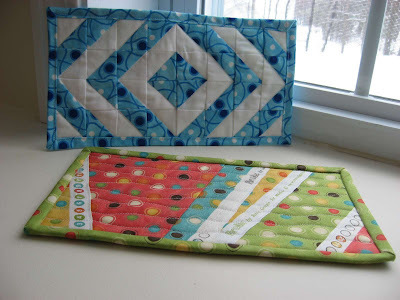 This little mug rug only uses up 32 of the half square triangle blocks, but now I know that even small scraps like this can become something fun and useful. For this mug rug, I found a fat quarter of this same blue fabric in my stash so I used that for the backing. I wasn't sure I'd have enough to make bias binding for the project, so I cut the backing about an inch bigger on each side than the size of the mug rug and I turned the edges over to the front to make the binding. I don't think it gives quite as finished a look to the edges as traditional binding, but still I like how it turned out and I think I did a good enough job on it to feel good about sending it to my swap partner. It's too late to jump into this swap now, but if you're interested in following along as swappers post pictures of their projects, you can click on the swap button and follow the links you'll find there. Over 300 people from all over the world joined this swap, so it should be fun to see all the different mug rugs that will soon be making their way around the globe. Wow I am so impressed with these mug rugs - you never cease to amaze me. What is the approximate size of a finished mug rug?? That's a huge swap! These mug rugs are really popular and fun to make. Just think how many Christmas presents you could have done!